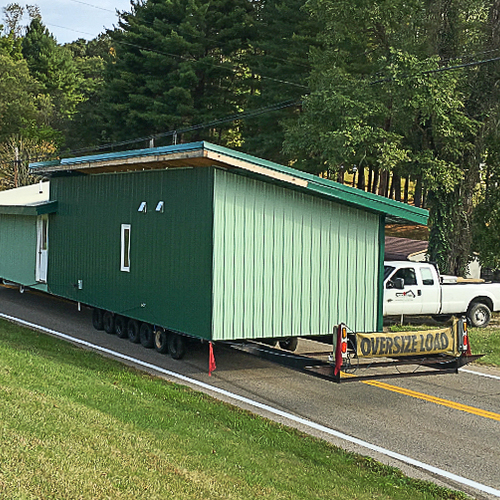 A Habitat for Humanity chapter built this energy-efficient three-bedroom home for less than $150,000. 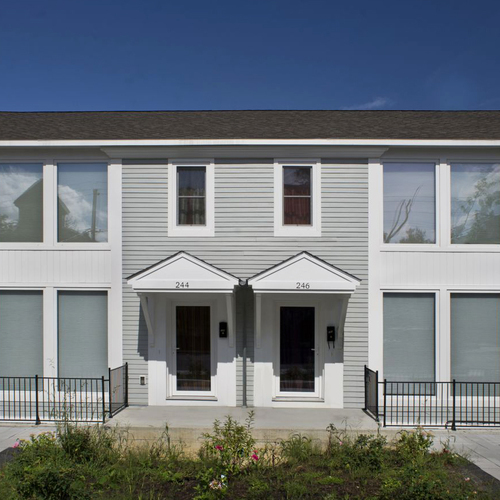 A Habitat for Humanity chapter in Kalamazoo, Michigan, is among six “grand award” winners in a Department of Energy Zero Energy Ready Home competition this year, proving that high performance doesn’t necessarily come with a high price tag. The annual contest recognizes innovative residential building in five categories, according to the DOE. Habitat Kalamazoo picked up the award for its entry in the Affordable Non-Profit category. Thrive Home Builders of Denver was the top winner in the Affordable For Profit category. In all, 23 builders from around the country earned innovation awards. The grand winners were announced in San Diego in October. Habitat for Humanity chapters in Venice, Florida, and Hickory, North Carolina, also were recognized. 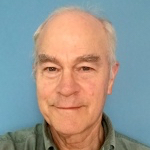 What separates Kalamazoo’s entry from the other top prize winners is its low cost, according to a post at LinkedIn by Philip Beere. While other winning entries carried price tags ranging from $400,000 to $1.6 million, Kalamazoo Habitat built its three-bedroom, 1,000-square-foot entry for less than $150,000. The design decisions that guide Kalamazoo’s building program are the work of Tom Tishler, the director of construction operations, who joined the program in 2008. At the time, the houses that the local chapter were building were Energy-Star-certified and had an average HERS Index of 78, meaning they were 22% more efficient that a code-complaint house, Beere writes. 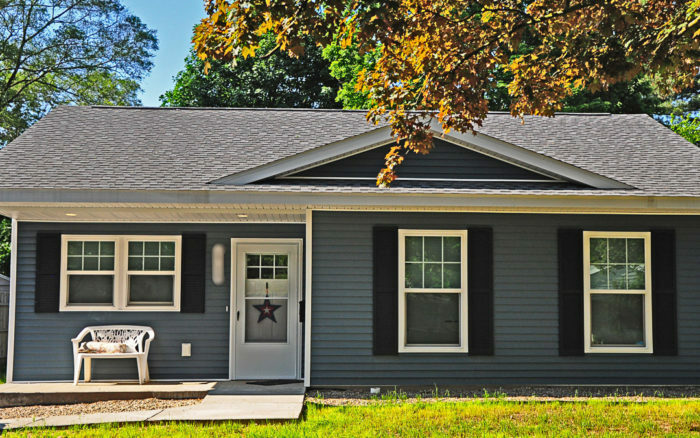 Now, Habitat Kalamazoo’s new homes get a HERS score of 50 or better. With certification from the Zero Energy Ready Home program, the houses should be able to hit net-zero performance with the addition of a renewable energy system (for example, a PV array). In a telephone call, Tishler said that the program had been building Energy Star homes until the Zero Energy Ready Home program came along. About the same time, Michigan updated its energy code, and Tishler realized that state codes and Energy Star weren’t all that different, meaning they had to try harder. 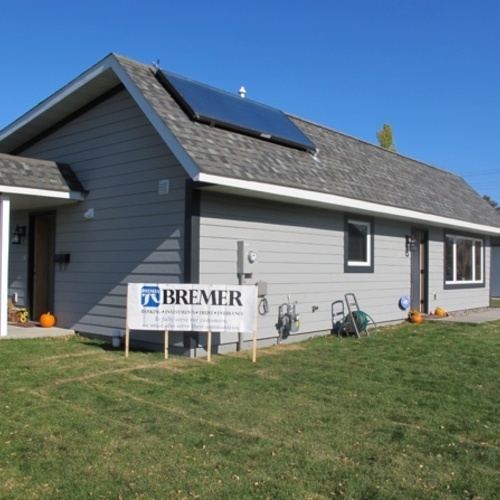 The chapter built its first Zero Energy Ready home in 2015. Each of the four to six houses it builds each year are now built to that standard. Habitat for Humanity serves people without a lot of money, so low energy bills and high comfort makes an appealing package. For the prize-winning house, the Habitat crew built its own insulated concrete forms for the perimeter of the foundation with 2-inch thick foam donated by Dow, he said, and also placed 2 inches of foam under the slab. Walls are framed with staggered 2x4s, 24 inches on-center, on 2×6 top and bottom plates. Corners are reinforced with 1/2-inch CDX plywood, and the house is otherwise sheathed with 2-inch foam. The 5 1/2-inch thick walls cavities are insulated with 2 inches of rigid foam and R-13 fiberglass batts, for a total wall R-value of about 33. The roof is insulated with 18 inches of blown-in cellulose (the trusses have a 16-inch high energy heel). All penetrations through the ceiling are sealed with spray foam, Tishler said, an approach that has drastically reduced air leakage. A house the program just finished, for example, tested at 1.8 ach50 with a blower door. The house that won the award tested slightly higher than that. Windows: Pella 250 series with triple-pane argon-filled glazing (U-factor of 0.21 or 0.22). Siding: Vinyl attached with 3 1/2-inch long roofing nails driven through the exterior foam. 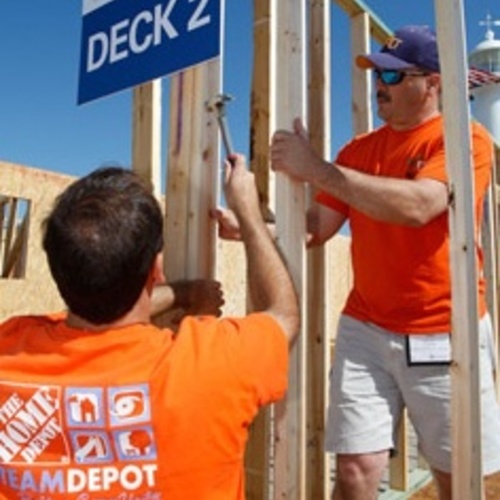 Getting volunteers not to pound the nails too tightly into the foam can be a challenge, Tishler said, but the siding is easy to install and relatively inexpensive. Whole-house ventilation: A Venmar F8 heat-recovery ventilator provides 80 cubic feet per minute of fresh air. Tishler said that the program is likely to begin using a Broan model with slightly more capacity in the future (Broan has purchased Venmar). Although the Venmar unit provided enough outdoor air to meet ASHRAE recommendations, Tishler said he though the house might still be slightly underventilated. Domestic hot water: Navien model 150 gas-fired tankless. The house is heated with a gas-fired furnace made by Dettson, a Canadian company. That may come as a surprise to the many advocates of ductless minisplit heating and cooling systems, but Tishler had good reasons for the choice. Chief among them is heating capacity, or rather too much heating capacity. The program had been using Amana furnaces, but the smallest one they could find was rated at 30,000 Btu/h (21,000 Btu/h on low-fire), while the heating load at the house was just 13,000 Btu/h at a design temperature of 0° to 4°F. The “Chinook” model from Dettson modulates down to 5,000 to 6,000 Btu/h and comes with a fan that can run as low as 150 cubic feet per minute. The ductwork consists of an 8-inch round main trunk line that feeds 2 1/2-inch miniducts to individual rooms. The furnace runs almost continuously in winter. The heating contractor they use recently installed a Dettson system on a for-profit job for between $17,000 and $18,000. Although the furnaces aren’t cheap, Tishler said, the payback is quick, and the systems are very efficient. Last December, for example (the coldest December in Michigan in the last 75 years), a Habitat homeowner spent just $105 for heat and electricity. Tishler said that the Habitat chapter has used ductless minisplits in the past, with mixed results. The other issue with a ductless minisplit is uneven heat distribution, Tishler said. Homeowners complained that the main living area might be a balmy 70°F while bedrooms were a chilly 55°F. The program tried a number of fixes, including transfer grilles and using Panasonic bath fans to distribute warm air around the house. But in the end, switching to the Detttson furnace solved a lot of problems. Tishler said that they can build a house like the one that won the award for about $80,000. That figure does not include the $10,000 or so in donated materials that come from manufacturers such as Dow and Square D. And it doesn’t include a number for the volunteer labor the program gets, accounting for about 75% of the labor total. With that in mind, Tishler estimates the house could be built at market rates for under $150,000. Tishler said that he’s the kind of person who loves tinkering with WUFI software and actively looks for ways to make his houses better. He’s eyed the Passive House building standard, but recognizes that he probably won’t get all the way there on his very tight budget. >"The house is heated with a gas-fired furnace made by Dettson, a Canadian company. That may come as a surprise to the many advocates of ductless minisplit heating and cooling systems, but Tishler had good reasons for the choice. Chief among them is heating capacity, or rather too much heating capacity. The program had been using Amana furnaces, but the smallest one they could find was rated at 30,000 Btu/h (21,000 Btu/h on low-fire), while the heating load at the house was just 13,000 Btu/h at a design temperature of 0° to 4°F." Those numbers look like a slam-dunk perfect fit for a Fujitsu 12RLFCD mini-duct cassette, which will modulate down 3100 BTU/hr @ 47F (well under the Dettson), and it can provide air conditioning. How is the Dettson a better choice than a ducted mini-split? Is natural gas so much cheaper than electricity that it makes the furnace a better financial choice? Fujitsu's documentation for the 12RLFCD says "Systems operate down to -5ºF." Kalamazoo occasionally gets much colder than this and as a builder, I'd be concerned about not designing strictly to manufactures specs. Does Fujitsu say somewhere that a) the unit will continue to operate at -22F and b) it won't harm the unit? Experience shows that it keeps running and is not damaged at temperatures cooler than what is fully specified for capacity. >"The protective function may work when using it outside the operation range." To me that is an indication that they anticipate that it will occasionally be operated outside of the specified operating range. How that is interpreted in the Japanese-legalese-English-legalese phrase book is beyond me, but I doubt it violates the warranty to keep it running at -22F, as long as it's running within the specified -5F to +75F operating range for heating most of the time. Kalamazoo's 99% outside design temp is +5F, so excursions below the -5F specified range will be well under 1% of the time. The capacity of the 12RFLCD at -5F is 15,000 BTU/hr @ +70F indoors, and would still cover the load at -5F of a house load with a Manual-J of 13K @ +4F. The 9RLFCD is good for 14K @ -5F-out/+70F-in , and would still cover the load of a [email protected] +4F house down to a bit below 0F, but without much margin for Polar Vortex events. > "The protective function may work when using it outside the operation range." Without more explanation, I'd have to conservatively interpret this as "may not work at all below -5F", even with some experience that indicates otherwise. Backup heat could be needed (and is a nice to have in any case). Other heat pumps do shut down completely when they hit some limit. Who knows, perhaps Fujitsu units shipping in the near future will have firmware that does this too - the specs/warnings allow for it. In MI, everyone running at low COP during a cold snap would be a worse grid load issue than summer peak AC loads (or everyone having tankless electric water heaters - there is less synchronization). If everyone switches to electric, expect some expensive transmission upgrades. Experience shows that the RLFCD series minisplits do not shut down at any temperature (unlike Mitsubishi H2i) and are still delivering a lot of heat well into negative double-digits. The "...running at low COP..." is primarily resistance heat. According to NEEP data -5F the AOU12RLFC compressor delivers a COP of 1.9 when running the full-out at 15KBTU/hr output when coupled to the AUU12RLF cassette, and a COP of 3.75 at that temp if idling along at it's minimum 2377 BTU/hr @ -5F. It will be comparable when paired with the ARU12RLF mini-duct cassette- way better than resistance heat. At Kalamazoo's +5F outside design temp it delivers a COP of 2.2 when running at it's maximum 16.5K out, and a COP of over 4 at it's minimum output of ~2650 BTU/hr @ +5F. So if it's modulating along at ~13K load @ 0-4F it will be in the mid to high 2s for a COP even at design temp. It's fair to let the grid operators & utilities manage the grid load- the tools (and regulations) for management of grid peaks are improving daily. Correlation of peak off shore and near-shore winds with the arrival of cold snaps in the Great Lakes region is quite high, but if they have to crank up some gas or oil fired peakers at 30% fuel-to-load efficiency during the 1-5% peak grid loads so be it. From an air pollution and climate perspective that is preferable to burning gas (at any efficiency) on site to keep houses and hot water up to temp the other 99.6 % (or more) of the time. At a COP of anything over 2 and an all combined cycle gas supplied grid the total emissions would be lower with the heat pump than with the Dettson or Navien. As of 2016 Michigan's generation output as a whole was 27% nuclear (low-carb) , 26.4% gas (mostly combined cycle), 6% renewables, and 39.2% coal. The economics of coal have been pretty daunting against renewables and combined cycle gas, so it's likely that their slice of the pie is less than 1/3 now, and by 2025 will be at best low-low double digit percentages. But even with the condition of the MI grid in 2016 the Fujitsu would have been lower emissions. >"The heating contractor they use recently installed a Dettson system on a for-profit job for between $17,000 and $18,000." Even with a price-gouging contractor the 1-ton Fujitsu mini-ducted mini-split solution would come in less than half that. Again, what were "...good reasons for the choice..." ??? >" Last December, for example (the coldest December in Michigan in the last 75 years), a Habitat homeowner spent just $105 for heat and electricity." There's ample reason to question the choice of a Navien tankless water heater here too, unless it had also been used to run a small hydro-air handler coil (or zoned room coils) for the heating system in lieu of the Dettson. Going all-electric with lower cost heat pump equipment for heat & hot water than the Dettson + Navien and applying the savings and foregone hook-up charges for the gas connection to ACTUAL rooftop PV (not merely "Net Zero Ready") probably pencils out favorably on a cash flow basis. It kinda makes me pucker a little bit, as I was looking to go minisplit on my upcoming build in zone 6 (it was -12f here 11/23 at 8 am) no natural gas here, so its electricity, oil, or propane..
Or some combination (heat pumps work very well when it's not super cold). Good for them! I do wish they had spent the additional $600 or so to completely sheath the exterior. "Corners are reinforced with 1/2-inch CDX plywood, and the house is otherwise sheathed with 2-inch foam." My builder was pushing me to go with a Dettson Chinook, paired with their Alizee heat pump. I pushed back and suggested a Mitsubishi heat pump. He agreed to look into it for me. Well, it all went together so well, they are building another NetZero home and it's going to have a Mitsubishi heat pump as well. My unit isn't modulating quite as nicely as a mini split, but the shortest cycle I've seen is an hour, and my average cycle time in cold weather is around 4-5 hours, so I can't complain. I'm curious - what is the expected behavior of your heat pump when you hit a near record January low? The heat pump will carry the entire load down to -25C. Below that, we have a Navien hot water heater with their h2Air system that will provide backup heat.